Welcome to our Health Committee page! Meet our fabulous Health Committee members for this year 2018/19! In our Health Committee this year we are focusing on happiness in our school. Our gardening club has been doing well growing some beautiful daffodils for the playground. Our garlic and rhubarb is also growing well and we'll soon be planting broad beans and potatoes. If you have any herbs at home in your garden that you could take a cutting from and bring in for us to plant (eg. rosemary, thyme, oregano, mint, chives) please let Mrs WIlson in year 2 know. Another lovely week focusing on what make us feel good. After asking the children what they would like to do in Feeling Good Week we: spent time on our scooters and playing board games with our friends; writing notes to put in the 'Feeling Good' bucket about who made them feel good; carrying out Mindfulness activities; thought more about Growth Mindsets and watched a video about a penguin who didn't give up so we can remember to "be like the penguin". To tie in with multi-cultural day we played playground games and team games from around the world. The staff showed how they felt good too by putting up post it notes in the staff room to share what went well in their week or funny moments they shared with the children. We all went home for half term feeling great! On November 13th it was World Kindness Day and so we had an "It's cool to be Kind" week. The children filled our whole school "Bucketful of Kindness", writing notes about people who were being kind and writing thank you notes and compliments to each other. Each child attempted to carry out 10 random acts of kindness during the week and for homework all the children had to show kindness to someone eg. at home, in their family, to a neighbour. The staff also joined in too, leaving notes and treats for other members of staff in their pigeon holes and having a shared lunch together. It was a very happy week in school indeed and it was lovely to think about others and make them happy! See below for some of our other 'healthy' focuses from this year and previous years. In October a local nutritionist came in to give a talk about healthy eating, focusing on healthy packed lunches, healthy snacks and fussy eaters among other things. Parents came out inspired with fresh and exciting ideas for feeding their children in a healthy but fun way, as did the PSHE Leader! In September we collected some of the food grown in our new planters that we built in Feeling Good Week. Despite the very hot weather over the summer we managed to grow some squashes, potatoes and small onions. They were passed onto the school kitchen and used in the children's lunches. The year 2 class were also lucky enough to have some squash soup that the cook made for them using the vegetables. It was delicious! KS2 gardening club also grew some potatoes and herbs which again were used by the school kitchen. We now have a KS1 gardening club who have just planted daffodil bulbs, garlic and lettuces. 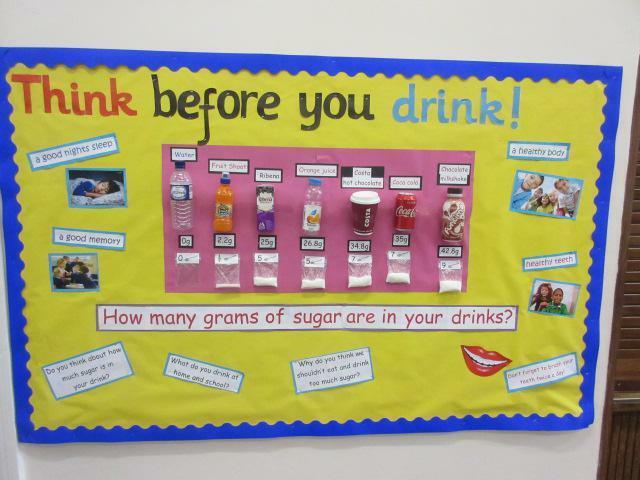 I hope you were able to see the display in the hall showing how much sugar is in different drinks. The children found this fascinating! Last year we introduced Fitter Future workouts which we use alongside the daily mile as a way of getting more exercise into our day at school in short bursts. The children have been enjoying it in school and we hope you've had a go at home. We also have "Wheelie Wednesdays" where the children are encouraged to come to school by scooter or bike. We have also had days where the children can bring them to school and use them in the playgrounds. We will organise another day like this very soon. Feeling Good week was a real success! Each class enjoyed some circle time sessions, problem solving activities, PE sports tournaments, a board games afternoon and the children brought in their scooters to scoot with their friends. Throughout the week the children also filled the 'bucketful of kindness' to describe who had been kind to them. We also applied for funding from the county to be able to build some vegetable planters to grow vegetables that can be cooked in our school kitchen. Some parents and children spent a few mornings building the planters and filling them with soil. We are now growing onions, new potatoes and squashes that our cook will use in school dinners next academic year! Each class is also growing a sunflower to see whose can grow the tallest! We'll keep you posted! A variety of children are in charge of watering the planters and gardening club are also keeping a watchful eye on them.